When defenseman Brian Dumoulin arrived in Pittsburgh, he already had two NCAA championships, two high school state titles and a junior hockey national crown on his resume. All he’s done since is hoist two Stanley Cups in the past two NHL seasons. A native of Biddeford, Maine, the 26-year-old Dumoulin previously won NCAA titles with Boston College in 2010 and 2012. He hauled the Stanley Cup to BC this summer, after visiting his hometown with it the previous year. Dumoulin is also on the verge of obtaining his bachelor’s degree in marketing, which he began as a BC freshman back in 2009. He’s been keeping up with his studies over the past five years since turning pro. Dumoulin's winning ways began before he ever set foot on campus in Chestnut Hill. He won two Maine Class A state championships with Biddeford High School, and then earned a USA Hockey Tier III Junior A National Championship with the New Hampshire Junior Monarchs before heading to BC, where he added seven more conference and national titles combined to his résumé. NHL players won’t be participating in the 2018 Olympic Winter Games, so Dumoulin won’t get a chance to represent his country on the world’s biggest international stage in February. 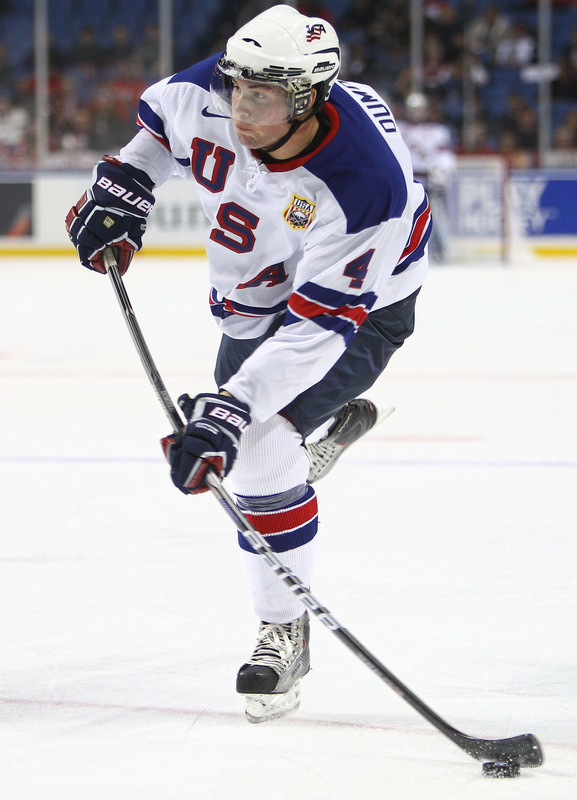 He’s had the opportunity to don the USA jersey in the past, though, most notably at the 2011 World Junior Championship. He recorded two assists and a plus-four rating in six contests that year in Buffalo, as he earned a bronze medal with the American squad. It was much the same at the college level for Dumoulin, where he earned Hobey Baker Memorial Award finalist status, as well as first-team Hockey East and All-America honors as a junior at BC. He also assisted on the winning goal in the 2012 NCAA title game that spring in Tampa, Florida, as the Eagles won their third national championship in five seasons. Dumoulin turned pro after that championship campaign with 83 career points and two NCAA trophies in tow. Dumoulin’s ability to rise to the occasion has transferred to the NHL. Last year he scored the opening goal in Game 6 of the final as the Penguins won, 3-1, and claimed their first Stanley Cup since 2009. He then averaged 22 minutes per game in the 2017 playoffs, including a team-high 26 minutes to go with an assist in the Cup-clinching Game 6 victory at Nashville. "Dumoulin is the one who got the most minutes because he's a good skater, he sees the play well, he moves the puck," said Penguins assistant coach Jacques Martin to NHL.com, after Pittsburgh became the first club to win back-to-back Stanley Cups since Detroit in 1997 and 1998. Dumoulin’s professional development included three campaigns with Wilkes-Barre/Scranton (AHL), before he joined Pittsburgh for good in 2015-16. Dumoulin credited current New Jersey Devils head coach John Hynes with helping him develop his game in the AHL, to the point where he become a mainstay on Pittsburgh’s blue line. Surprisingly, Dumoulin found his NHL rights traded from Carolina (2nd round selection, 2009 draft) to Pittsburgh in 2012 without ever playing a game for the Hurricanes or their affiliates.